U.S. Secretary of State Rex Tillerson condemned the "horrendous atrocities" suffered by Myanmar's Rohingya Muslim population. The U.S. State Department says Myanmar's treatment of the Rohingya people constitutes ethnic cleansing. After his recent trip to Myanmar, Secretary of State Rex Tillerson said Rohingya Muslims in the country were facing "horrendous atrocities" from some security forces and vigilantes, partly in retaliation for attacks by Rohingya militants. 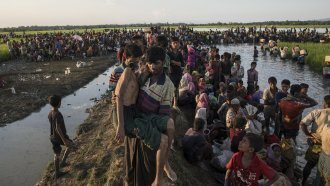 No country officially recognizes the Rohingya people as citizens, leaving them vulnerable to persecution. The latest wave of violence in Myanmar started in August and has pushed more than 600,000 Rohingya to flee for nearby Bangladesh. Tillerson's ethnic cleansing designation is largely symbolic, but could open the door for economic sanctions. The State Department announced last week the U.S. is sending an additional $47 million in humanitarian aid to help the Rohingya.